Trees, I’ve heard, have rather low self-esteem. They do so because it is very difficult to tell one from another. If you’ve ever tried it you would know it is very difficult to stand out and be unique as a tree in a forest full of other trees. As with most things, however, there are a few exceptions. There’s Boston’s Liberty Tree, Methuselah, a 4,800 year old bristlecone pine, General Sherman, a 1,450 cubic meter giant sequoia and Hyperion, northern California’s Redwood that towers at 155 meters. There is another tree however, that we should take note of. It is called the Tree of Tenere (seen here) . 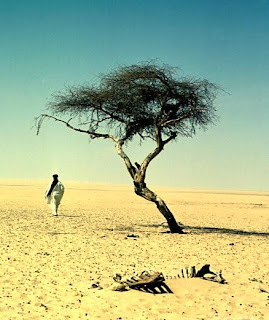 The Tree of Tenere is an acacia tree that grows in the Tenere region of the Sahara Desert. It is the only tree, and only plant life, for 250 kilometers in any direction. It is estimated to be over 30 years old. In 1938 a French military team, curious concerning this truly remarkable tree, found the trees source of life. Its roots weaved their way 35 meters through the dry desert crust to a heretofore unknown underground aquaphor. This incredible tree had survived the baking climate of one of the world’s harshest deserts by having the courage and patience to throw down roots until it found a source of water. The French Team built a well on the site and the tree became a landmark and major stopping point as travelers journeyed through the desert. So much so that it is the only tree on large scale maps at a scale of 1 to 1,000. Then in 1973 a Libyan truck driver was traveling through the Tenere region at night. He was intoxicated and, as only a drunk could do, the front fender of his truck found the only tree, the only thing standing for that matter, in 250 kilometers any direction. He hit the tree. The tree snapped from its trunk and its long and beautiful tenure as the lighthouse of the Sahara was ended by a careless, inebriated man. If only someone had cared enough, unsightly as it may have been, to have erected a fence around the tree, it might still be preserved yet today for us to appreciate. Instead in its place stands a crude memorial, fashioned from old metal and truck parts, honoring the place where a tree once grew in a desert, and found thirsty travelers a source of hope. The account of that remarkable tree, and its tragic and unnecessary death, serves as a warning and a reminder to the necessity of a fence. Fences are ugly. Fences are restricting. Fences require maintenance. Fences don’t have a good reputation. 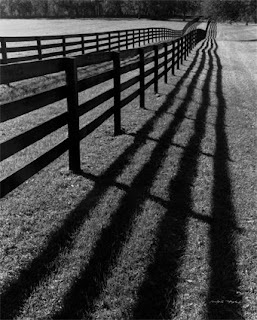 We must recognize however, that fences don’t just serve to keep things in, they also serve to keep things out. If we really care for something, and wish to protect it from the careless and inebriated elements of this world that would destroy, we must be willing, unsightly as it may appear, to build a fence around those things we cherish and safeguard the hope we find therein. Wouldn’t you build a fence if you found the deserts only tree?